TWIN AND TRIPLE FANS: In low static pressure applications, these fans provide high airflow in a very thin package. An exclusive KOOLTRONIC design provides exceptionally quiet operation in both intake and exhaust applications. Whether mounted horizontally or vertically, these minimum vibration fans require little internal cabinet space, leaving virtually the entire cabinet free for power supplies or other components. Both the KP500 (Twin) and KP875 (Triple) fans fit standard 19" equipment racks. 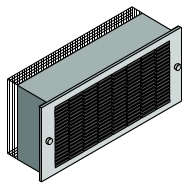 FILTER BOX FANS: High airflow with low noise operation makes these versatile packaged fans very popular in a wide range of applications, especially with their minimal internal cabinet depth requirement. Reversible designs allow user to push or pull air through the enclosure. In addition, these fans can be installed internally or externally, vertically or horizontally, with or without a filter on either side. With the KOOLTRONIC special motor mount isolation system, these fans operate virtually vibration-free. 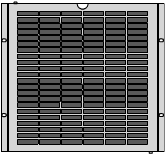 Front and rear grilles can be adjusted to accommodate or omit filter. Filters are easily removable for cleaning and replacement. All motors, whether permanent split capacitor or shaded pole, are UL/CSA Recognized and include automatic-reset thermal overload protection. Designed for low temperature rise, Kooltronic motors are also cooled by the blowers' intake air, for maximum motor life. All motors are UL Recognized and carry a Declaration of Conformity to applicable CE Standards. Special permanent lubricants perform over a broad temperature range: -20°F (-29°C) to 250°F (121°C). .
*A&B Configurations. 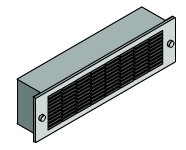 See Filter Box Fan Configuration for details.